"The English shrimper, though not likely to be perpetuated by the chisel of the sculptor, has frequently been depicted by the painter, as one of the most pictorial objects, to animate his compositions of the sea coast. These amphibious nymphs, who live as frequently in the water as on the land, are a hardy race, whose occupation administers to the delights of the table, furnishing the rich and the hospitable with a dish of dainty fare. 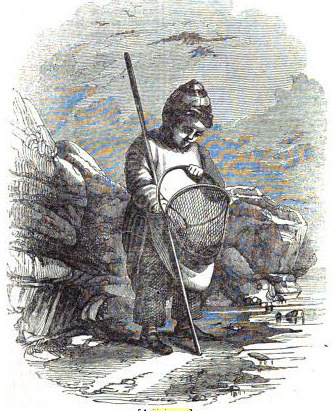 The diminutive fry, which is the object of their pursuit, are not only shrimps, but prawns, which when in prime season, and well boiled, form not only a delightful show, their brilliant red coats being garnished with green parsley; but a most delicious and savoury entremet, fit for the board of Apicius himself. 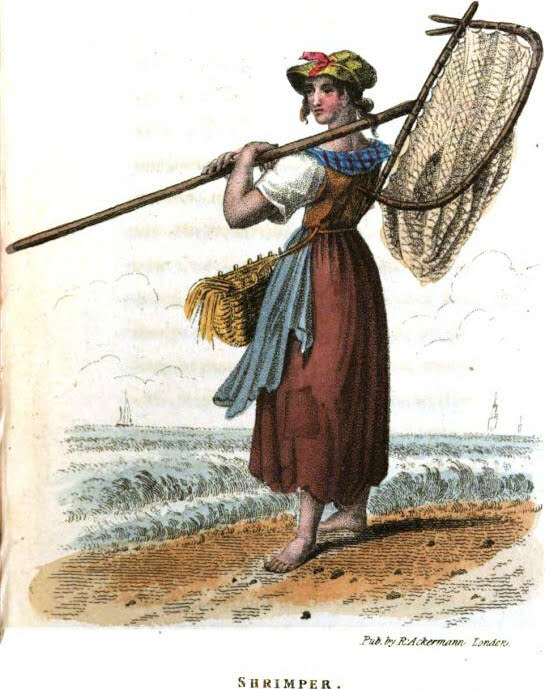 The shrimper takes her net, and venturing into the sea, remains not unfrequently amidst the breakers for hours in succession, scouring the shingle or sand with her net, which is bent, and at the end of a long pole, as described in the print. The produce of her labour in the season, when the watering places are crowded with visitors from the metropolis, and other parts inland, are disposed of on the spot. At other seasons, they are sent to the London market, and are frequently sold at a considerable profit."